The Microsoft stock forecast for 2016 is for hefty gains as Wall Street begins to recognize the full potential of the company's cloud business. Not that 2015 was a bad year for Microsoft Corp. (Nasdaq: MSFT). Microsoft stock gained 18.65% last year, while the overall market was flat. And since Satya Nadella was named CEO on Feb. 4, 2014, MSFT stock is up about 45%. But Microsoft's strong showing over the past two years doesn't mean Microsoft stock is played out. On the contrary, Nadella's efforts to re-orient the Redmond, Wash.-based tech giant's businesses have only just begun to bear fruit. Nadella has done a good job of jump-starting Microsoft's transition away from over-reliance on its traditional cash cows of Windows for PCs and Office software. He's doing it by emphasizing Microsoft's Azure cloud business, rethinking how the company sells its software, and boldly pushing into promising new areas of tech such as augmented reality. And in 2016, these efforts will have a bigger impact on MSFT's earnings. "The new era of MSFT is starting to resonate with investors and we expect shares to continue to benefit from the move to higher quality platforms as well as the company's aggressive push to the cloud," UBS analyst Brent Thill said in a November research note. While analysts generally like MSFT stock – according to The Wall Street Journal, it has 22 "Buy" ratings versus 11 "Holds" and three "Sells" – their average one-year price target is only $57.85. That's less than a 10% increase over the current Microsoft stock price of about $53. But a closer look at the true value of Microsoft's cloud business, as well as its other recent initiatives, suggests the consensus price target is seriously undervaluing the stock. The chief catalyst for Microsoft stock in 2016 and beyond is clearly the cloud. Microsoft's cloud business has two major pieces: Azure and Office 365. Azure is Microsoft's cloud service that it sells to other business. It's essentially a data and application hosting service. Until recently, most companies built and maintained their own data centers, but have learned that buying the service from a vendor like Microsoft or Amazon.com Inc. (Nasdaq: AMZN) is cheaper and more efficient. And they like being able to buy cloud services on the fly. That means there's a huge opportunity here. Market Research Media forecasts annual compound growth in global cloud spending of 30% until 2020. At that point, the cloud will be a $270 billion market. Currently Azure is about a $1.58 billion business for Microsoft. But it's growing like crazy. In the September quarter, the company reported that Azure revenue increased by 135% year over year. In fact, Azure is growing even faster than Amazon Web Services, the market leader. Amazon's cloud revenue for 2015 was about $8 billion. So not only is the cloud a growing market, but there's plenty of market share an aggressive Microsoft can take from Amazon. Microsoft's other cloud business, Office 360, also shows much potential. Office 360 is simply Microsoft Office via subscription, rather than the old disk-in-a-box version. But switching Office to a cloud-based model both evens out the revenue from the product and makes it more profitable. According to Microsoft, the subscription model will increase user revenue as much as 1.8 times. So far Office 360 has 18.2 million subscribers, with about 25% of Microsoft's corporate customers converting as well. MSFT reported it had added 3 million Office 360 subscribers in the September quarter alone. Wall Street has underestimated the value of this transition. Adobe Systems Inc. (Nasdaq: ADBE) started switching from the old model to a subscription model for its popular Creative Suite software in 2012. Net income is up 160% since 2014. Adobe stock has rocketed more than 200% since the program was announced in October 2011. The combination of Office 360, Azure, and some other Microsoft cloud businesses such as Skype and Xbox bring in about $10 billion in revenue now. 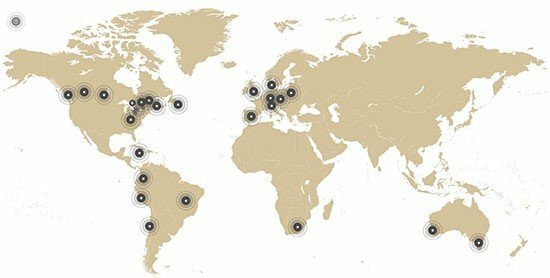 The company expects that to double by 2018, and it's easy to see why. We'll also learn more in 2016 about HoloLens, Microsoft's intriguing augmented reality project. With HoloLens, 3D images are projected on objects in the room with the user, a significant difference from the fully immersive virtual reality of a device like the Oculus Rift. The HoloLens, however, shows promise not just as a gaming platform, but as a completely new computing paradigm. A developer version is due this year, which should get investors to start factoring the product into the Microsoft stock price. "Most people don't realize how big the impact is going to be," Money Morning Defense & Tech Specialist Michael A. Robinson said of the virtual reality market. 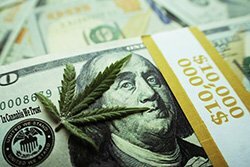 "This is a market that's set to go mainstream in 2016, and the market will be huge. And the good news for Microsoft is that the augmented reality segment will take the lion's share of sales." Here we are more than halfway through a Microsoft stock forecast story and we've barely mentioned Windows. Slowing PC sales have eaten into Microsoft's Windows revenue, but the product is assuming a new role in the Microsoft universe. The company will continue to sell Windows licenses to PC makers, but upgrades to customers will be free. The idea is get Windows 10 on as many devices as possible – not just PCs, but tablets, smartphones, and the Xbox. Nadella has realized that Windows is the heart of Microsoft's ecosystem of products and services. The company is trying to leverage its dominance of PCs to spread its platform everywhere else that computing has invaded, from mobile devices to home automation to automobiles. That strategy will take a while to show results, given that Microsoft is pretty far behind Apple Inc. (Nasdaq: AAPL) and Alphabet Inc. (formerly Google Inc.) (Nasdaq: GOOGL) in the mobile and Internet of Things spaces. But it's a smart move. That's higher than the average analyst target mentioned earlier, but still pretty conservative. Fully factoring in Microsoft's cloud strategy, it's easy to get to gains of 30% or more. "I think we see over $70 in 18 months, and, along the way, they're going to pay you a nice dividend," Chris Bonavico, a portfolio manager at Jackson Square Partners, told Barron's. Microsoft currently has a dividend yield of 2.62%. The company has raised the dividend every year but one (2009) since it started paying one in 2004. Another analyst, Bernstein's Mark Moerdler, is even more bullish on MSFT stock. He believes Microsoft's FY2017 EPS could go as high as $3.84. That would put the Microsoft stock price at about $80 – a gain of more than 50% from where it is now. The Bottom Line: Since CEO Satya Nadella took the helm in 2014, Microsoft has shed its stodgy image and pursued a cloud-based growth strategy that will drive the MSFT stock price higher in 2016 than most analysts think. Wall Street has underestimated the benefit Microsoft will get from its growing Azure business and its Office 360 subscriptions. And the company's HoloLens virtual reality product will provide yet another catalyst for Microsoft stock in 2016. 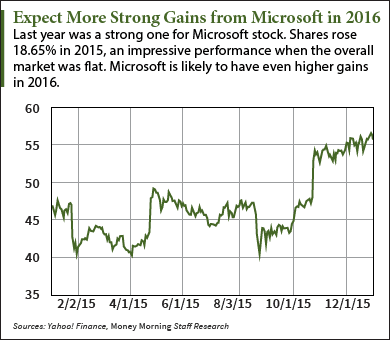 Expect Microsoft stock to soar past the analysts' estimates to gain 30% or more this year.